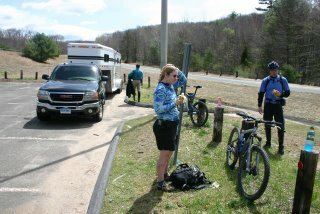 and from here we staged a horse trailer at Exit 8 off of Route 9PX file and you will get a much more detailed view of this Epic Ride. Cockaponset State Forest is the second largest state and my vehicle off of Clark Road in Higganum. While the map on the left is a pretty good overview of the ride which I made using GPS Visualizer, check out www.crankfire.com where I uploaded the GPX file. The forest It is named after an Indian chief who is buried in the Ponset section of Haddam. The DEP acquired the Weber parcel of 354 acres for $780,000 in 1998. 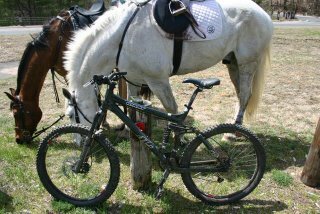 Favorite activities include hiking, horseback riding, and mountain biking. 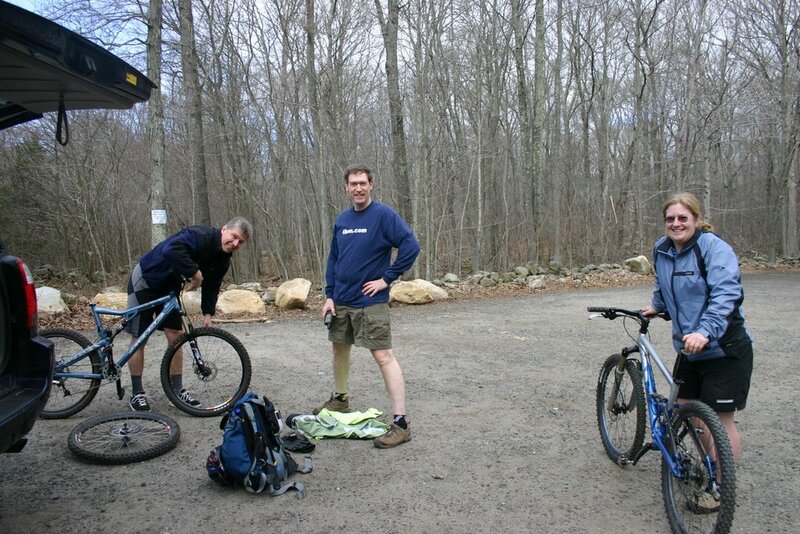 On the first leg of this Epic Ride, Paula, Alex and I started at Weber Woods in Killingworth, CT. Here we are, pictured left. The weather started out funny. It was breezy and partly sunny and it was hard to tell what to start the ride with on. I settled for a t-shirt (which I took off after about 15 minutes) and long sleeve t-shirt. 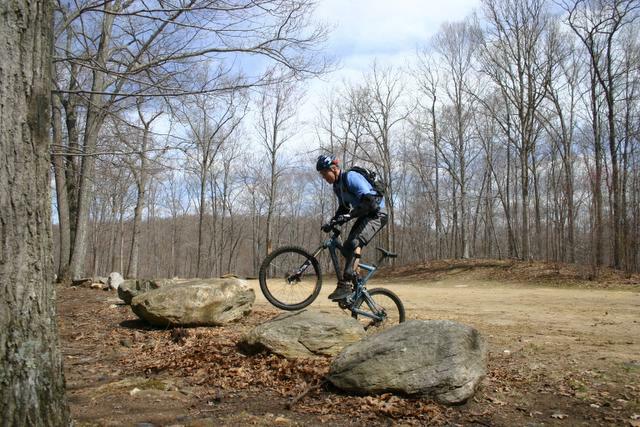 Weber Woods is primarily composed of rode dual track trails that are frequented by equestrians and mountain bikers. In fact, it seems that an organization called Sprock Kids, which is affiliated with NEMBA rides here and periodically does Trail Maintenance with BPC. There were some nice stream crossings and some not so nice because they appeared to be more like intermittentant streams and still muddy from the winter thaw. We met up with the rest of our party, two horseback riders from BPC and proceeded to follow them on what appeared to be seldom ridden trail that took us to State Route 80. After crossing Route 80, we took another trail/old woodsman road that led eventually to some nice narrow dual track. This trail took us past the Chester Airport, although you couldn't see it, there were quite a few planes either landing or taking off and eventually we came out on Butter Jones Road in Chester. Followed that to Sypher Road which led us to State Route 148. 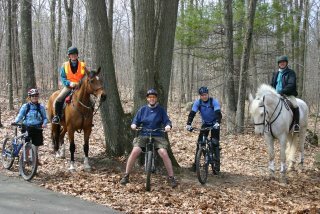 We took a little break at the southern entrance to the Pattaconk Lake portion of the Cockaponset State Forest where I shared my stash of carrots with the horses. The ride on Filey Road (decaying asphalt) includes a quite a bit of climbing as well as descending but there isn't much challenge because its just a road. Off to the left and right there were numerous trail heads for other trails, including the Cockaponset Trail, which was blazed, I think with a baby or Infantry Blue and a red dot in the middle. Paula mentioned that there was another trail through here called the Pattaconk Trail but I didn't see any special blazes. 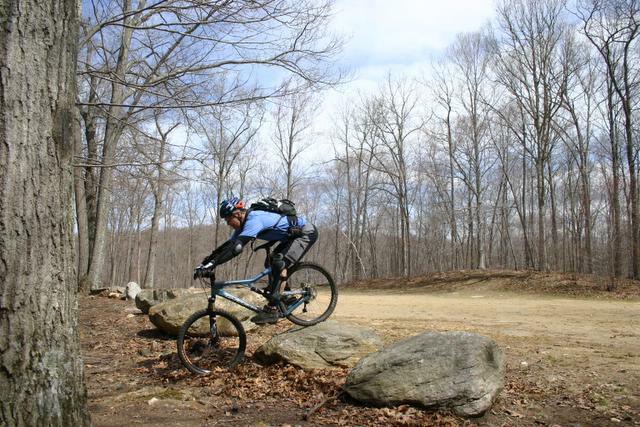 Hopefully, sometime in the future, this Epic trail will only have to use the hardball just to get into the state forest and then branch off into the woods and pick up one of the non-regulated trails. We descended upon the Pattaconk lake parking area where we were met by Patty of BPC with snacks and water. 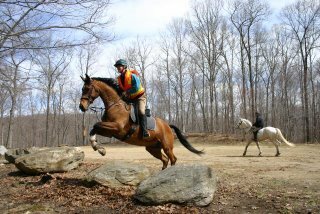 There was a demonstration on jumping rocks both by mountain bikes and horses. I think the horses stole the show. 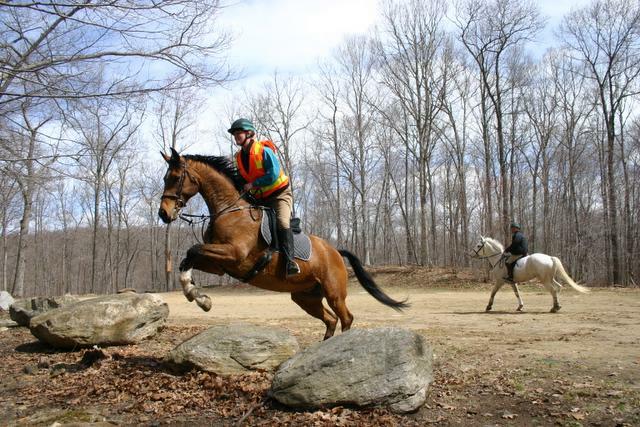 Kristen is jumping the rock with her horse, whose name is Simba. And here is Brad on his Simba. Simba seems to be rage in horse naming. 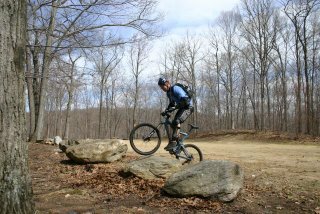 And after quite a few attempts, maybe it was the size of the rock that proved daunting to Alex, he did finally make a good show of how to do it properl y on a mountain bike. and then got back on the trail. From here more dual track that climbed the ridge that overlooks the Pattaconk Lake and then pretty much planed out for a few miles of easy riding. At one point, we came out onto a dirt road, on the map is called Old Country Road, where we turned due west and the horses took off galloping. 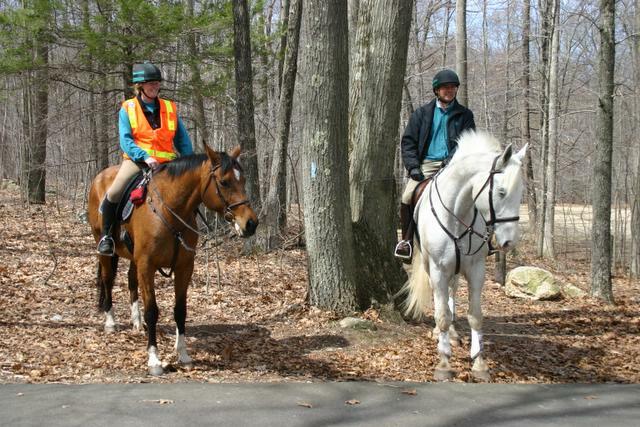 After I finished marking the waypoint on GPS for the turn and climbed the hill, the horses were no where to be seen. They are fast! Picked up another trail and actually lost satellite signal for about 20 yards or so. We followed this trail to Jericho Road, another dirt road in the State Forest, which by this time we were now in the northern section of the forest, as seen as on the DEP's map. It was pretty much down hill from there and the bikes took off first but the horses, not wanting to be left out of all the fun came galloping after us. At one point when I was bombing this one hill I could hear the thunder of hooves gaining on me. 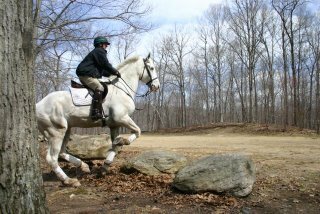 I moved as far over on the road as I could and then Brad on Simba (the big white horse from the previous pictures) came barrelling past like a freight train. 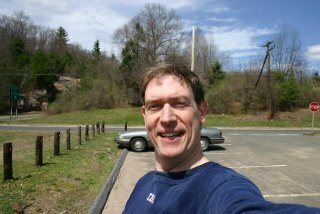 Eventually, we came to the turn off onto the gold trail that would take us down to Beaver Meadow Road and on in to the commuter lot at Exit 8 from State Route 9. There we had some more snacks, Brad and Kristen loaded their horses into the trailer, we took a few more pictures and then Alex, Paula and I pushed on to the last leg of the trip. Here is my AC next to the horses grazing on some fine, State of Connecticut Commuter Parking Lot Grass! What a tasty treat after a long ride! I was amazed at how light Alex's Intense VP 5.5 was. It was a feather in my hands. Paula's new Gary Fisher Cake was even lighter, although it was a small frame. Compared to my almost 40 pounds Giant AC. Patty met us there, took a few group shots and I took this beautiful self portait with helmet head. 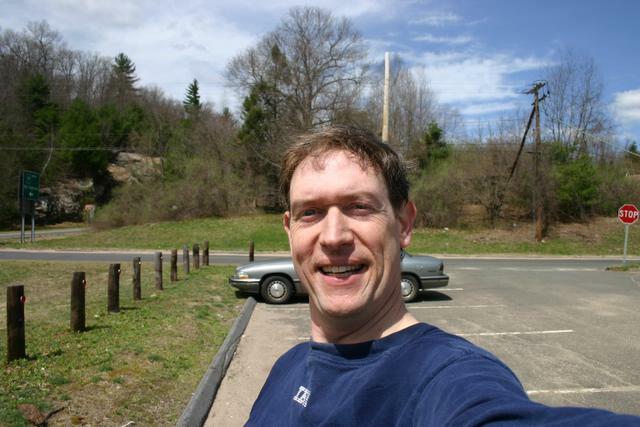 Of course was funny is that after taking that picture, I realized that I had been riding with my shirt on backwards, DOH! Mounting back up, we road more hard ball to get to the last leg of the trail, which was more dual track, that gave way to an intense double layered hike-a-bike on a trail that was pretty eaten up by Enduro and ATV riding. Trail eventually spit us out onto a cul-de-sac. Another 100 yards of hard ball to next trail head which was the really chewed up by ATVs, super techy, and worst type of trail to be on your last leg of endurance. Finally, we arrived at my car. Of course, what would have been really nice is to have cracked open an ice cold MGD when we got there but I left the cooler by the fridge this morning, DOH! 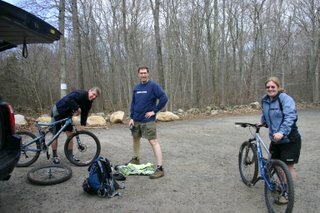 So, we loaded up the bikes and headed bact to 7/8's to recap the ride and have a little a lunch. Total Odometer on the GPS: 14.9 Miles!